If you, a family member or friend believe you have a longshoreman claim, you need a lawyer who understands the differences between the various laws that affect longshoreman claims, will handle your case aggressively, will fight for you, will keep you informed, and will make sure you get the largest award you deserve. That lawyer is Attorney Thomas More Holland. What Are the Types of Longshoreman Claims? Under the Jones Act, an injured seaman can sue his employer and any other responsible parties for all of his damages, including pain and suffering, past and future wage losses, and medical expenses. A worker is a “seaman” if he is “permanently assigned to a vessel or fleet of vessels in navigation.” The Jones Act applies to individuals who are permanently assigned to a traditional vessel, and to workers on offshore oil rigs and other similar structures. A seaman can file claims against his employer and other parties under the Jones Act. He can file a negligence claim against his employer or a claim that the vessel he was working on when he was injured was not seaworthy. In a negligence claim, the seaman must prove that his employer’s negligence was partly responsible for in causing his accident and his injury, and he will receive damages based upon the percentage of his employer’s fault for causing the accident. An “unseaworthiness” claim focuses on the vessel itself or the equipment aboard the vessel. A worker who does not qualify as a Jones Act seaman because he was not working aboard a vessel in navigation may be entitled to benefits under the Longshore Act. 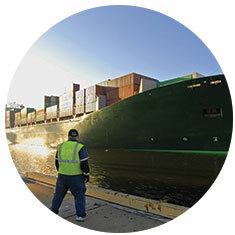 Generally, the Longshore Act covers employees engaged in maritime activity, but not on vessels. Most Longshore cases involve shipyard workers or workers on fixed platforms. Claims under the Longshore Act are similar to workers’ compensation claims, and employers must pay wage losses and medical expenses. In addition, an injured longshoreman who accepts compensation under the Longshore Act may file a negligence action against a third party. Under the Longshore Act, a longshoreman may file negligence claims against any third parties responsible for his injuries, and the worker can collect damages if he can prove that the third party in any way caused the accident. A longshoreman may also file a claim against his employer if the longshoreman can prove that his employer was acting in the capacity of a “vessel owner” and that the worker was injured while aboard the vessel. The Law Offices of Thomas More Holland is one of the few law firms that represents longshoreman. We know the laws and procedures for these cases, and make sure that our clients receive all of compensation they deserve. Yes. Longshoreman cases are complicated. You need an attorney who understands the various laws, who will work for you, and has handled these cases. Attorney Thomas More Holland has represented Longshoreman for more than 20 years, and the attorneys and staff of the Law Offices of Thomas More Holland have the knowledge to handle your case. You should consult an attorney as soon as possible so that the attorney can explain your rights. At the Law Offices of Thomas More Holland, we believe that one of the most important services we provide is explaining the law to our clients. Too often, insurance companies and employers do not provide complete or accurate information. It is important to have someone who works for you who will explain your rights. Attorney Thomas More Holland and his staff give every client personal attention, investigate and analyze the facts of every case, and provide zealous legal representation. Our staff of attorneys and paralegal will help you understand your rights and do everything they can to get you the best possible results. If you, a loved one or a friend has been injured, contact The Law Offices of Thomas More Holland by filling out a simple form, by sending an email or by calling (215) 592-8080.